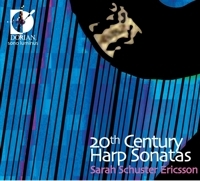 Sarah Schuster Ericsson make her debut on Dorian Sono Luminus with the new album, 20th Century Harp Sonatas. These sonatas captivate listeners with their poetic meanings matched with rhythmic combinations of energy and technically demanding passages that only a truly virtuosic performer such as Ms. Ericsson could achieve. GRAMMY® nominated harpist, Sarah Schuster Ericsson make her debut on Dorian Sono Luminus with the new album, 20th Century Harp Sonatas. These sonatas captivate listeners with their poetic meanings matched with rhythmic combinations of energy and technically demanding passages that only a truly virtuosic performer such as Ms. Ericsson could achieve. The first harpist to be nominated for a GRAMMY® for a Classical Solo Recording, Boston-based harpist Sarah Schuster Ericsson, comes from a family of accomplished musicians. She began her musical studies at the age of five with the piano before turning to the harp at age ten with her mother as her teacher. Ms. Ericsson studied at The Cleveland Institute of Music, where she received her Bachelor of Music degree. After graduation, she joined the Baltimore Symphony Orchestra where she premiered many solo works for the harp. She later joined the Boston Symphony Orchestra. During her tenure, she played in major concert halls around the world and worked with many of the world’s top conductors. After 10 years with the BSO, Ms. Ericsson left to pursue a career as a soloist and recording artist. As a soloist she has appeared with many of the area’s distinguished ensembles including the Boston Pops, and as a featured guest at the National Harp Society conference. The album features works by 5 of the premiere 20th century composers who wrote sonatas for the Harp: Paul Hindemith, Alfredo Casella, Nicolas Flagello, Germaine Tailleferre, and Pierick Houdy. With the wide range of styles and nationalities of the composers, the music is brilliantly varied in a way that engages the listener. Houdy’s Sonata composed for his wife Ghislaine de Winter the year they were married contrasts Casella’s which was written during the defeat of his home country Italy in World War II while dealing with his own failing health. Hindemeth based the third movement of his Sonata on the melancholy poem Lied by the 18th Century poet Hölty. From the New York Composer Flagello who’s opening movement takes full advantage of the harps capabilities, to the only female member of the avant-garde French composers group Les Six who begins her Sonata (written for Spanish harpist Nicanor Zabaleta) with a steady march like rhythm.